2) If it’s not too late for you, do NOT sign up for that cost-cutting redeye flight home. I wish I would have paid the extra $$ to leave at a normal time after my husband reminded me of the redeye hell we went through getting back from L.A. But why do I persist in thinking it sounds glamourous to say, “I’m taking the redeye in from the Coast”? Oh well…one more day to eat, I guess. To avoid being stuck sitting on the floor, arrive early to panels you really, really want to attend. And, in fact, official AWP does not sanction sitting on the floor because it’s a fire hazard and you’ll be creating a barrier to those who have accessibility needs. Not sure how they feel about standing in a herd in the back? The point is, don’t sit on the floor—be mindful of others if there’s a herd of standees, and arrive early. If a panel is bad, ditch it. Yes, it’s rude. Yes, everyone does it. (Be better than the rest by at least waiting for an appropriate break, but if you must go mid-word, GO.) I can’t tell you the high caliber of presenters that I have walked out on, but think Very High. Remember that there are a thousand other options, and you have choices. The only time you have to stick it out is if A) the dull panel participant is your personal friend or B) the dull panel participant is/was your teacher or C) the dull panel participant is your editor/publisher. Those people will notice (and remember) that you abandoned them mid-drone and punish you accordingly (i.e. your glowing letters of rec will flicker and fade). Undoubtedly this is why I have never been published in Unnamed Very High Caliber Magazine, having walked out on that editor’s panel. There are zillions of panels: When you pick up your registration badge, you’ll get a massive tome with information about all of them, and also a shorter schedule that’s easy to carry around. Be dutiful and glance through the ads in the tome since these are the funders who subsidize our conference. Then ditch the tome and carry around the smaller master schedule….unless you are an app person (I’m not). Either way, do take time NOW to go to AWP’s website and scroll through the schedule and select EVERY panel that sounds even moderately interesting, and load those into the “my schedule” feature. Keep that stored on your favorite technology (mine is a sheaf of printed paper…which may be smart since I often forget how/where to re-access “my schedule,” which requires logging in and somehow finding “my account”; I assume app people are more adept than I am). Anyway…no point waking up early on Friday if there’s nothing you want to attend. I checkmark panels I might go to if nothing better is going on and star those that I will make a supreme effort to attend. Give yourself a couple of options at each time slot so that if a room is too crowded, you have an interesting alternative. Don’t say anything gossipy on the elevator, unless you want the whole (literary) world to know it. Do listen up to the conversations of others on the elevator, and tell your friends absolutely everything you’ve overheard during your offsite dinner. Speaking of famous people or former teachers or friends…do not say something like this in one long breathless opening sentence right after hugging hello: “Great-to-see-you-can-you-write-a-blurb-letter-of-rec-piece-for-my-anthology?” Ask for favors AFTER the conference! I mean, unless you enjoy that uncomfortable moment and awkward triumph of trapping someone into saying yes. Support the publications at the bookfair. Set a budget for yourself in advance, and spend some money on literary journals and books and subscriptions, being sure to break your budget. Do this, and then you won’t feel bad picking up the stuff that’s been heavily discounted or being given away free on the last day of the conference. But, please, definitely do spend some money! These journals and presses rely on OUR support. Just because something is free, you don’t have to take it. Unless you drove, you’ll have to find a way to bring home all those heavy books/journals on an airplane. Or you’ll have to wait in line at the hotel’s business center or the UPS store at the convention center to ship them home. So, be as discerning as you can when you see that magic markered “free” sign on top of a pile of sad-looking journals, abandoned by the grad students with hangovers who didn’t feel like dealing with their university's bookfair table. Don’t laugh at this, but bring along Purell and USE IT often. For weeks after, post-AWP Facebook status updates are filled with writers bemoaning the deathly cold/sore throat/lingering and mysterious illness they picked up at AWP. We’re a sniffly, sneezy, wheezy, germy bunch, and the thought of 12,000 of us packed together breathing on each other, shaking hands, and giving fake hugs of glee gives what’s left of the CDC nightmares. Escape! Whether it’s offsite dinners/drinks/museums/walks through park/mindless shopping or whatever, do leave at some point. You will implode if you don’t. Also, the food on the convention floor is consistently overpriced and icky…you will starve if this is your entire diet. Bring your cellphone charger and maybe even a portable charger. Or maybe you like huddling around electrical outlets? I can’t believe I’m writing this: the Dance Party is FUN! I mean it! You don’t even have to go with anyone or be a great dancer (call me Exhibit A). It’s how to work off stress and reenergize after a long, sometimes daunting day after too many snubs, imagined and real. I mean, I’m sure there are all kinds of interesting undercurrents and nuances out there in the depths of that packed dance floor…but also, on the surface, it can just be FUN. Finally, take a deep breath. You’re just as much of a writer as the other 11,999 people around you. Don’t let them get to you. 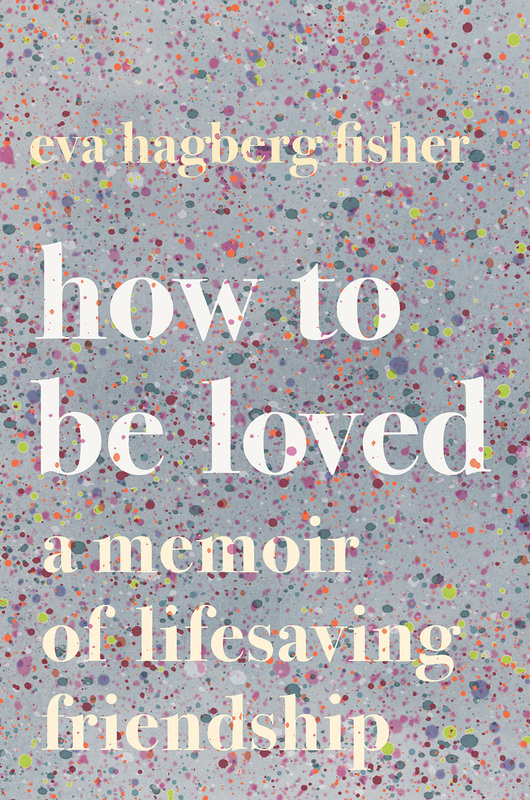 This book is, at its heart, about intimacy. With our work, with our most beloved friends, our families, our chosen families, our doctors, our colleagues, ourselves. It is about how I was loved so much that I was transformed from being a very lonely person into a less lonely person. What boundaries did you break in the writing of this memoir? Where does that sort of courage come from? I wasn’t aware of boundaries while I was writing, though now that it’s coming out I wonder what kind of covenants of secrecy I’ve broken with my family, my friends, etc. I did break one formal boundary, which was about time and foreshadowing: I kept foreshadowing the character Allison’s death, in increasingly present ways, which I did in order to mirror my experiential sense of her dying - which is that I kept knowing that she was going to die, and was still absolutely floored with grief when she did. I love that your question indicates the presence of courage, but I’m not aware of being particularly courageous. I mostly feel scared a lot. But I wrote this book because I felt driven to, and I wanted to try to solve certain structural and creative issues that I had thought about a lot in terms of memoir as a genre, and I wanted people to get to meet, in some sense, my friend who had died, and so I didn’t really have a lot of analytical self-reflection about how brave or not the writing was while I was doing it. Ahhhhh so many highs, which are never high enough. A starred Publisher’s Weekly review. Being on various lists - Entertainment Weekly and Nylon’s top 50 2019 books list. Tremendously beautiful blurbs. Knowing that I accomplished my lifelong dream. And then lows - the only lows that I’ve felt have been entirely self-inflicted, and all about envy and ego and self-confidence. For instance, yesterday I got the February issue of O Magazine, and wasn’t in it (I hadn’t expected to be, but hope lights the heart forever), and I felt an acute sense of rejection and loss. I had to reach out and ask a friend with experience to remind me that I don’t need to be in charge of my book. I did my job, which was writing it. The rest is out of my hands. It really helps if you need to write to live - I became a working journalist fifteen years ago and knew that if I didn’t land a pitch or file a story, I couldn’t afford rent. It compressed any creative fear that I might have had, and gave me a really pragmatic approach to writing. So when I sold my book, I just very pragmatically did my job and met my deadlines. I like a very clear exchange of work and money, and I like to need to write in order to afford my life. How linear I was able to make extremely non-linear experiences. I have pages and pages of attempted structural outlines, and notes of conversations with my editor, and it felt like it was totally impossible to get a clear narrative out of the events that had occurred and the way that I felt about them, but here we are, with a story that goes from A to B to C, that has a beginning and an ending. How do you approach revision? I wrote about 47 drafts - so I love revision. I approach it with a lot of enthusiasm - something I learned from working with editors for years. A good editor can feel like a miracle worker; my book editor is truly the best. With this, I went over and over and over the text until I felt like I had the basic map, and then I started doing chapter-level revisions, then got more and more granular. I would often email sections to myself and purposefully read them while I was distracted - on the BART or walking around - to see how it felt. For the last few months, I read it out loud to myself every night before I went to sleep to feel which sections dragged or felt boring/obvious. I wrote the book in many parts over a period of a few years, and I think that the last few months of reading it through / out loud smoothed out so many of the potentially rough edges. TBR [to be read] is a new feature on my blog, a semi-regular, invitation-only interview series with authors of newly released/forthcoming, interesting books who will tell us about their new work as well as offer tips on writing, stories about the publishing biz, and from time to time, a recipe! 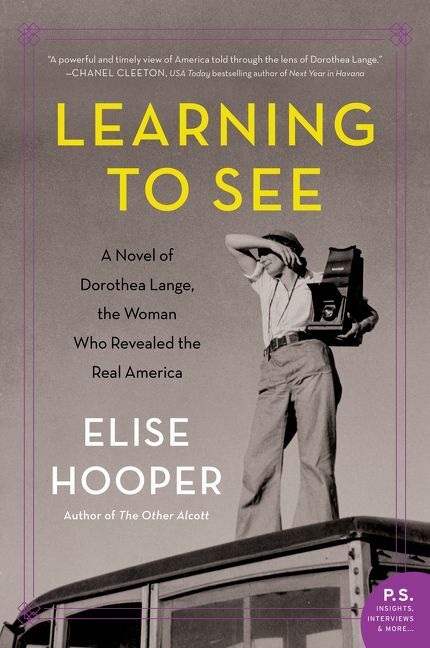 LEARNING TO SEE is historical fiction based on the life of pioneering artist Dorothea Lange. This novel tells the story of her transformation from San Francisco’s most successful society portraitist in the 1920s to a documentary photographer determined to show the truth of what was happening to America’s poor and disenfranchised in the 1930s and ‘40s. Dorothea captivated me from the beginning because of the idealism that inspired her work, but she was a complicated woman who had to make difficult choices that placed many stresses on her personal life. I wanted to provide context for her work and life’s decisions so readers could draw their own conclusions. I also enjoyed fleshing out painter Maynard Dixon, Dorothea’s first husband, because he cut a colorful figure, romantic and talented, but he was not necessarily what you would call a great husband. An important source for me when learning about Dorothea Lange was an oral history she had done for the University of California. I had downloaded the more than 300-page transcript from the online library and used it often. When I visited Lange’s archives at the Museum of California in Oakland, I realized the interview that I had been relying upon was abridged and the original was spread out over nine binders. I experienced momentary panic that I’d missed important information, but once I started reading through the binders, I saw that the unabridged version contained every word that was said. Every word, all the ummms, the nonsequiters, everything. So, whew, I realized everything was okay! As I wrote this novel between 2015 – 2017, the political climate of our country shifted in a way that felt very relevant to Dorothea Lange. She was a figure who experienced a major awakening during the 1930s and her work reflected her activism. As I took part in the Women’s March in 2016, I couldn’t help but think that Dorothea would have loved to have seen so many women taking to the streets and raising their voices to support marginalized Americans. I also found myself surprised (and disheartened) that so many of our current day issues are similar to what was happening in the 1930s and ‘40s, but Dorothea’s belief in the power of helping people through storytelling inspired me and kept me uplifted. Her storytelling took the form of creating images, but storytelling can come through many different creative forms and it’s more important now than ever to keep talking and learning from each other. The working title of this book was LANGE for a long time, but I came across an interview with one of Dorothea’s grandchildren in which the she described how Dorothea always told the kids that “seeing” was a learned skill and that it was important to “learn to see.” My editor and I thought this idea captured the book so we went with it. Ha, I think Depression-Era food is best left alone.